Zen LOA is a special version of LOA. As shown on picure, a special red piece called 'Zen' is available. The 'Zen' pieces can act both like a friendly and ennemy piece. 1. At his turn, a player can move on of his piece, or the special 'Zen' piece. 2. 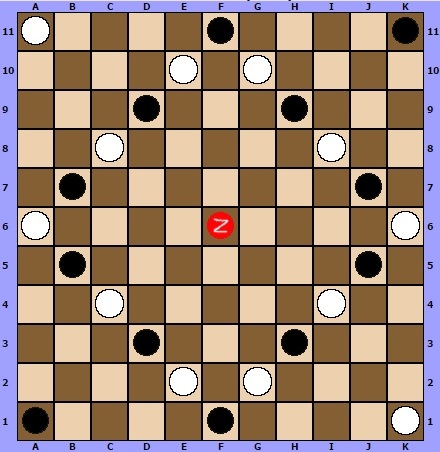 When a player moves the 'Zen' piece, the other player may nor replace this piece on the square where it came from during the previous move. 3. The 'Zen' piece can be friend or ennemy, at the player's convenience. It means it can be captured or it can be jumped over. 4. To win, a player must have all his pieces connected, the 'Zen' piece included, if it stills exists.